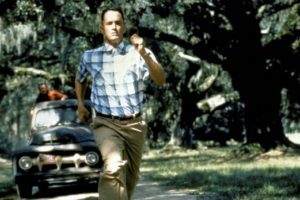 In the movie Forest Gump, Forest is being chased down by a group of men throwing rocks from a truck that’s trying to run him down. Throughout the film, Forest ironically shows a positive response to what most people would consider to be seriously traumatizing situations. A walk home with Jenny, to Free Dr. Peppers to all you can eat ice cream… Forest finds a sense of joy or gratitude throughout his trying situations. I find humor in distressing situations can bring about some relief from the pain. Providing brief moments of joy, even while in suffering.